This is one of the more well known rolls which can be found in a lot of sushi restaurants. This roll is very similar to the Unagi Roll. It’s so tasty! I absolutely love this roll. This (along with the Crunchy Shrimp Roll) is one of my favorite rolls that I have made thus far. Don’t worry if your rolls don’t turn out looking very good. Believe me, my first few rolls had rice and avocado falling off of the rolls and making a HUGE mess! It takes some practice, but it’s worth it as the end result turns out looking absolutely beautiful. 🙂 So just keep trying and let me know how it turns out! Slice the avocado into very thin (but still thick enough so they don’t tear when you put them on your sushi) slices. 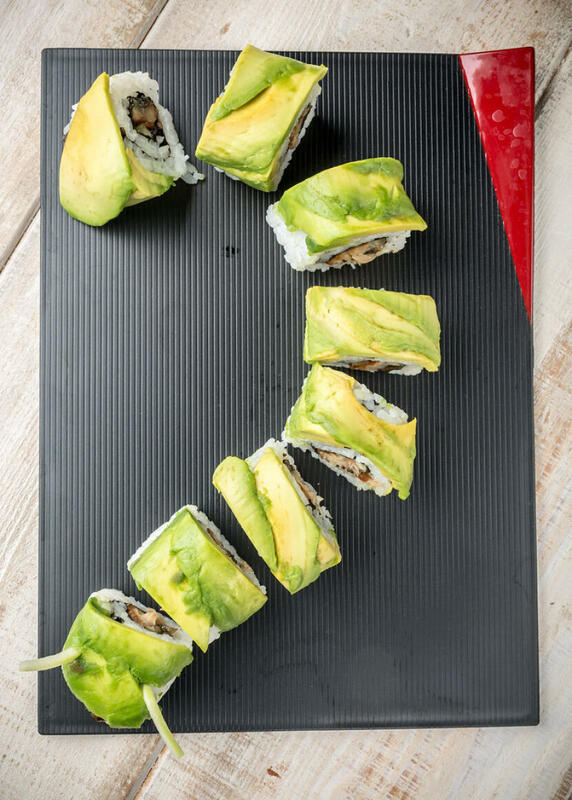 Roll the sushi inside-out, using cucumber and unagi as your fillings. 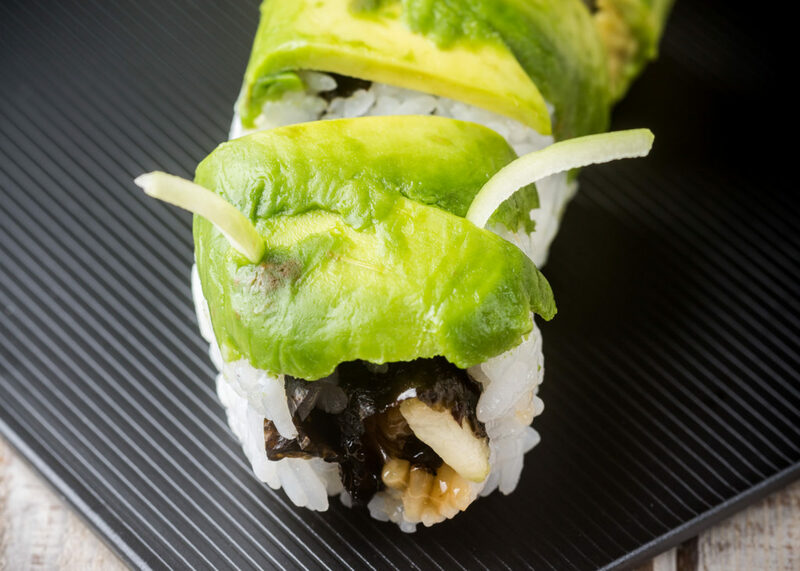 Place the avocado slices overlapping on the sushi as described in the How to Roll Inside-Out Maki post. 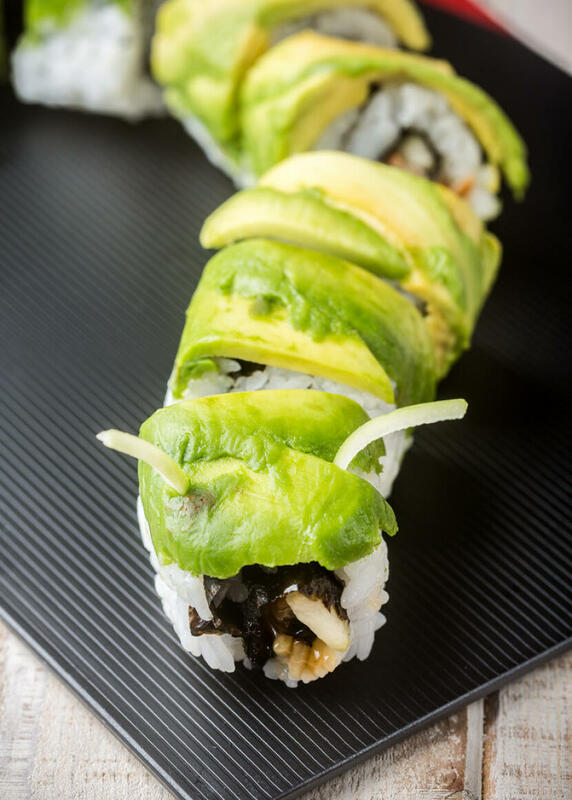 I love unagi rolls too and this caterpillar roll looks so…. Good!!! Does anyone know the sauce that goes along with this? Unagi Sauce? Yvo – 🙂 Me too! Kevin – Eel sauce: 1/2 cup mirin (sweet rice wine), 1/2 cup shoyu (soy sauce), 1/4 cup sugar, and 1 cup dashi (optional) – put all ingredients in a saucepan, simmer until all ingredients are combined. Let cool, and drizzle over your sushi or put in a bottle and refrigerate. I tried my own sushi recipe, cross between the caterpillar roll and the philly roll, it was awesome! The basic ingredients: inside out roll, eel, crab, cucumber, and fried cream cheese for the filling. Topped with roe and avacados. Try it. I just ate a Caterpillar roll (8pc) at a local restaurant, but had them leave off the eel sauce. Are there really 27g of fat in one roll? And is that including the sauce? I have had the Caterpillar roll at a Hibachi grill restaurant and I fell in love with it. I have had many kinds of sushi, and I am glad you put up recipes so we can make them at home!! I am very much into Asian cuisine! I am Korean American who loves all types of Asian food! Keller – That estimate is based on the amounts of each ingredient that I used. Every restaurant makes theirs a little differently, so I can’t guarantee that the nutritional data will be the same for the restaurant you go to – as I said, it’s just an estimate. hi tis is my most favorite sushi i would never forget this sushi ever since my first time eating it on my birthday! i enjoyed it so much its my most favorite sushi i was 4 when i first ate it! Ah, sushi. Love sushi. I don’t make it very often nevada doesn’t get much good fresh fish at good peicrs, and to me cooked sushi (which is mostly what you see here) is wrong, so wrong.Tasty, but wrong.However, I do have one little heresy of my own. Substitute course-ground german horseradish mustard for the wasabi.